Most people know the Mustang for its power and classic design. While it may have been updated every year, the latest 2018 Ford Mustang is an incredible experience in American engineering and driving experience. There is also a new driving mode available with the premium trims for the Mustang. These would include the Shelby GT and Shelby GT 350. The all new drag racing mode allows you to turn the Mustang into a race machine. With over 526 horsepower in the premium trims, you can take on anything in this beast. There is also the MagneRide damping system, which will you adjust to the road conditions in real-time. You will get a smoother ride as well with the changes made to the suspension and steering. 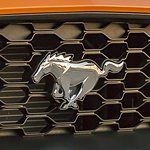 Want to test drive the incredible new Mustang? Check out the latest models when you go for a roaring spin at Mullinax Ford of Kissimmee.